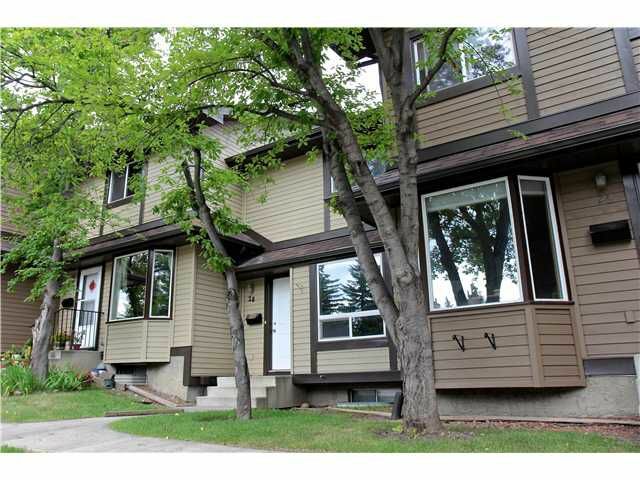 IMMACULATE, 3 bedroom townhouse in MOVE-IN condition! Over 1500sf of living space on 3 levels. This large, OPEN Living room with big SOUTH FACING PICTURE WINDOW, has enough room for living and dining sets, perfect for entertaining! The BRIGHT kitchen has space for a kitchen nook and leads out to your own PRIVATE brick PATIO! Upstairs features 3 bedrooms and a full bath with a HUGE Master bedroom that easily fits a King size bed! Basement is developed with a large family room featuring a WOOD BURNING FIREPLACE!! All of the windows in this very well run, well managed, complex have all been replaced, along with a newer roof, patio doors, eaves and the hot water tank replaced in 2010! Freshly painted, low condo fees of $275/month, including water and sewer and you are still within walking distance to CROWFOOT CENTRE and the C-TRAIN!! Available for quick possession. Call your favorite Realtor to view! OPEN HOUSE SATURDAY, AUGUST 10th between 2-3:30!